Jade discs were produced in China since the Neolithic, but the present piece differs in material, shape and design from any ancient style. The thick circular disc is cut from a deep green stone with darker mottling. 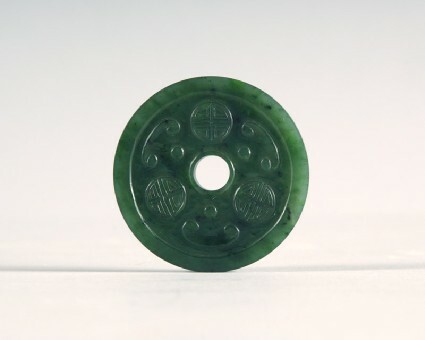 It has a small circular hole in the centre and is decorated on one side with raised bosses, on the other with three shou (‘long life’) medallions, curl motifs and raised bosses. The central hole and the rim are outlined by a raised band.